As part of the dementia awareness drive by Samvedna Senior Care Foundation, seven free memory screening camps were conducted across Delhi NCR and Gurgaon in the month of March-April 2019. Areas covered included RWAs/SCAs of Safdarjung Enclave, Sukhdev Vihar, Laxmi Nagar, and Samvedna senior centres in Gurgaon and Anand Niketan, Delhi. More than 100+ people were screened for memory impairments and related concerns. 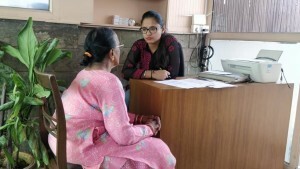 On 16th February, 2019 Samvedna Senior Care Foundation conducted its Support Group meeting for caregivers of dementia patients. A group of caregivers from in and around Gurgaon and Delhi came to attend the meeting. The topic of discussion for the meeting was “Importance of early detection and intervention and managing challenging behavior”. The session was opened by Dr. Jayashree Dasgupta, Project Director, Samvedna Senior Care. Samvedna Senior Care has been conducting dementia support group meetings for families regularly for the past 5 years. As a part of our interactions we have come across many caregivers and heard their experience in handling their loved ones. Caring for an individual with dementia can be challenging and at times it can also be overwhelming. Frustration and stress is a normal and valid emotional response to many of the difficulties faced by a caregiver. While some irritation may be a part of everyday life as a caregiver, feeling extreme frustration can have serious consequences for the caregiver or the person they care for. It negatively impacts the caregiver’s physical health and may lead to some serious consequences. Samvedna Senior Care Foundation held it Dementia Support Group meeting for family members of persons with dementia on January 5th , 2019. The event was held at our senior centre in Gurgaon. 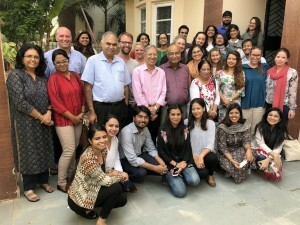 Dr. Jayashree Dasgupta, MPhil, PhD, Neuropsychology, NIMHANS, presided over the meeting, the topic for this meeting was “Caregiver stress and coping strategies”. Dark mornings and even darker evenings with chilly grey days in between means winter is here — and with the cold season comes the winter blues. If you or your loved one struggle with the “winter blues” you know how difficult it can be to make it through the holiday season. Although winter does bring in the festive holidays it also means less sunlight, shorter days and colder weather. As a result it leads to reduced physical activity, more sleep, less interest in activities, social withdrawal, unhealthy eating and a general sense of feeling low. Note from our Founder: Celebrating 5 years of Samvedna! When I set out to start Samvedna in early 2013, honestly, I had a hazy picture of what I wanted to do. The only thing that was clear to me was to make a difference in the lives of seniors, break the mundane routine and do something about their loneliness and social isolation. The idea of an activity centre, a platform for seniors to socialize and also channelize their energy in a positive way, was thus born. Soon we realized that a lot of seniors cannot come to the centre because of mobility issues, hence the home services were developed. Samvedna Senior Care turns 5! Mr. Malhotra (name changed), a retired IAF officer, lives with his wife (55), who was diagnosed with Alzheimer’s at the age of 53. Mrs. Malhotra has always been an active and independent woman. She is a highly educated woman and was working as a scientist till a few years back. She was diagnosed with Alzheimer’s and since then her disease has been progressing rapidly. Mr. Malhotra has been her primary caregiver. Mrs. Malhotra is suffering from some other ailments as well and requires monthly visits to the doctor for review. She is unable to manage her own medicines and gets really hassled every time she goes for a doctor’s review. On 6th October 2018, we conducted our Support Group Meeting for caregivers of dementia patient. A large group of caregivers from in and around Gurgaon and Delhi came to attend the session. The main agenda of the session was to acknowledge the pain of caregivers and to help them in their needs. The topic of the session was “Dementia Management Impact of Social, Physical and Cognitive Interventions. The session was unlocked by Dr. Jayashree Dasgupta, MPhil, PhD, Neuropsychology, NIMHANS, who is the Project Director of Samvedna Senior Care. Marriage is a scared union between two people, where the couple vow to hold on to each other for better or for worse, in sickness and in health, until death separates them apart. But what happens when one of the loved one does not remember, not only the vows, but the spouse with whom he/she took the vows?